In an effort to provide one of the most comprehensive restaurant platforms we are extending the Deal & Coupon Management system into free accounts. That’s right, free accounts will now be able to publish one deal/coupon per month at no cost. Why use Deals on OpenMenu? No high markup. Deals and coupons are unlimited in Premium+ and Platinum accounts with no additional cost. Deals and coupons are in front of your customers and potential customers not deal hunters. This means people interested in your restaurant are getting a deal and are more likely to become a repeat customer. Deal hunters don’t convert to repeat customers. With our powerful, and easy to use, Deal manager restaurants can manage their deals in real time. Setup a deal, publish live and your deal appears on Facebook, mobile site and your website. Nothing else needs to be done. Want to promote your deal? Use our powerful social integration and push your deal to Facebook (your personal page, your restaurant’s page, a group – you have the option) and/or Twitter. Don’t want the deal to run anymore just turn it off or delete it all together. Restaurants stay in control. The power of our deal manager allows restaurants to define a daily deal, coupon, happy hour special and much more. This new feature is all about control and giving that control back to restaurants. 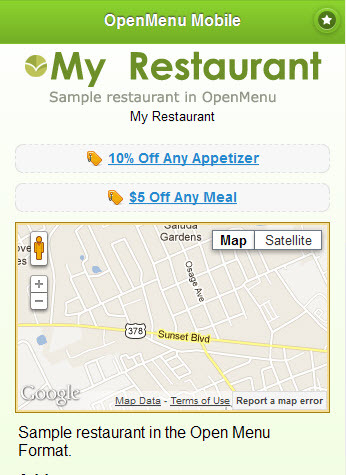 The powerful mobile site given to all restaurants on the OpenMenu Platform is fully equipped to handle deals and coupons placing them in a place sure to entice viewers. Publish a deal and it automatically appears on the restaurant’s mobile site. We’ve even released a special Facebook App called DealTab to power a dedicated tab on your Facebook page with your deals. Combine them with your menu through OpenMenu Tab or break them out. The choice is yours.